State of NAWBO OC Speech by Katie Adams Farrell. Delivered on July 10, 2018. I’m here and I’m having one of those how did I get here moments? One of those, am I sure I belong here? Well I do. I’m here and you’re here, so let’s do this, shall we? The State of NAWBO OC implies that I’m going to tell you something about how we’re doing as an organization. And I am. I think as women and business owners, we don’t often have the leisure of looking backwards. And I’m not talking about beating ourselves up about something that happened, we’re happy to do that – I’m talking about reflecting on what we’ve been through that’s brought us to this point – that’s brought us here. What we slayed and what could have benefitted from a different approach. This kind of reflection teaches us as much about who we are today as it does about the past. 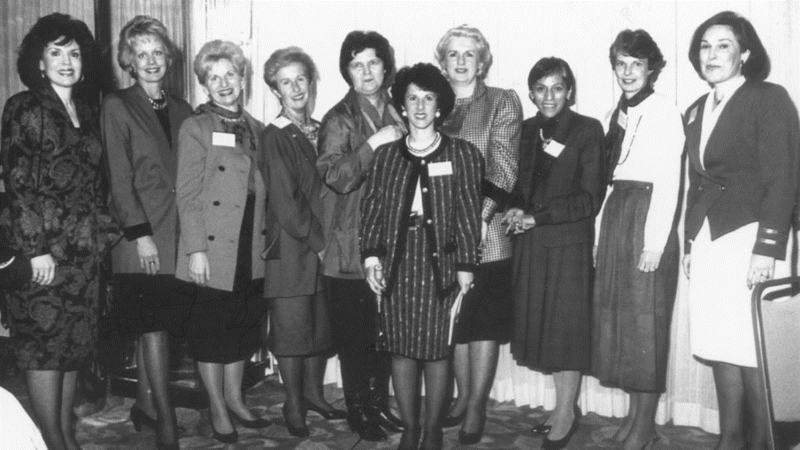 NAWBO was formed in 1975 by a group of a dozen businesswomen in the D.C. area to serve as the first advocacy organization for all women business owners. 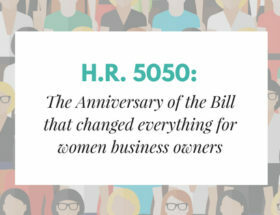 NAWBO members were responsible for drafting the landmark legislation HR5050: the Women’s Business Ownership Act, which gave women the right to access credit and capital in their own names without a male co-signer. It was signed into law in 1988 – just thirty years ago. The Orange County chapter of NAWBO was formed in 1991 with the help of the local District Director of the SBA, Sandy Sutton. Sandy reached out to 10 prominent business women, which turned to 30, in less than two months, and at our peak, served more than 400 members. Nita Busby was elected the first president – and Rachel Owens was our fourth. The efforts of our early leadership laid the foundation for one of the most vibrant chapters in the Country. I’d like to recognize the past presidents in the room with us. And with Theresa, we arrive at today. We have spent a few years in transition. I’m sure you’ve felt it. For some of you that have been around longer than five years, you’ve witnessed the decline in membership first hand. I’ve heard the whispers, ladies. So I’m going to talk about it out loud now. This decline in membership is not a reflection of NAWBO OC’s significance or relevance to our community or our impact on women’s entrepreneurship more broadly. There will always be members who come to us looking for referrals and make the decision NOT to stay and become a part of the community. And we honor their decision. 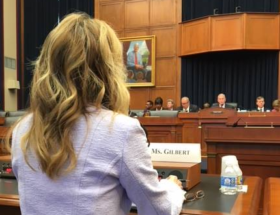 My point is to connect this hyper local experience with the broader experience of women and small business in the United States. During the financial crisis, women and especially women of color, started their own businesses in droves – largely out of necessity. Unemployment skyrocketed – we lost our jobs – and we couldn’t find new ones. We had no choice. At the same time, existing small businesses were shrinking and their access to capital dried up and they laid off staff. Ok but this isn’t an economics lesson, what does it have to do with us? The financial crisis changed the nature of work. Some call this the Gig Economy. I call it the Inevitability of the Hustle. For the past ten years, women business owners have come to NAWBO OC with smaller businesses, looking to network, looking to SELL, because we need to pay our mortgages. At the same time, we weren’t necessarily looking to BUY immediately. So the people that left us left for a million reasons, I’m sure, but my theory, without interviewing every one of them, is that they can be placed into two main broad strokes buckets. 1.) They weren’t getting enough business and couldn’t justify the expense or 2.) They owned larger small businesses and this influx of microbusinesses didn’t feel relevant. I also want to tell you that our chapter is certainly not the only chapter with this experience. Chapters across the nation contemplated closing their doors! When I was in DC last month for the President’s Installation and Onboarding, I met multiple incoming President’s who are taking on the responsibility for literally rebuilding their chapters. These women came together with two options, shut down, or rebuild. They chose rebuild. A testimony to the resilience of women. I think. And as for Orange County, we are still one of the largest and most active chapters in the nation. So our challenge today is this. How do we present programs that are inclusive? How do we help the millionaire business owners among us, because there are many of them, feel like they are getting quality, relevant content while also providing the guidance and tools that micro businesses need to grow? And some of you will roll your eyes when I say grow – I used to roll my eyes when Liz said grow – but it was the exposure to women who built big small businesses that made me understand that building a big small business is in fact very much for me. We need you, Circle. Just being here with you opens new doors to understanding ourselves, our goals, and our ambition. And for those of you that are still rolling your eyes at me and my talk about going big – I think we can all agree that making more money is a good thing. And that, by definition, is growth. 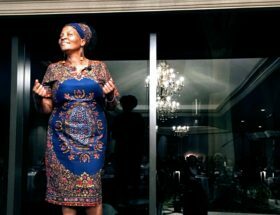 My challenge – and the challenge I put to all of you – is how do we truly embody our creed to equally represent all women business owners? How do we consciously endeavor to build an inclusive table for all women? That’s what we’re going to do this term. We’re going to build a bigger, more inclusive table. The 2017-18 term, under Theresa’s leadership, was a pivotal year for NAWBO OC. You probably noticed the pivot programmatically in Liz’s term two years ago. Liz empowered the Board to up our game for our members. She instituted Success Teams, which have helped women save their businesses, and renewed our focus on Public Policy, which we now call advocacy because it seems to be a little more palatable. 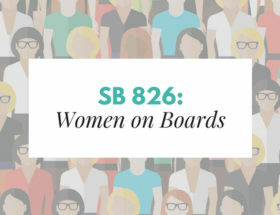 In fact, NAWBO CA and NAWBO National followed suit and they refer to their Public Policy initiatives as Advocacy initiatives too. OC is the trend-setting chapter, ladies, let me tell you. What you saw in Theresa’s term was high quality, wildly entertaining, inspirational, relevant dinner meetings. You also saw the premier of a couple of really important Advocacy programs like the Legislative Breakfast and Appointments Training. What you are probably not fully aware of is how hard Theresa and Liz worked behind the scenes to shore up our operation and to begin to subtly shift the language we use to talk about ourselves, our businesses, and each other. Every action Theresa took during her presidency was carefully and purposefully planned and executed. You know, like, down to the tee shirts she wore, right? I was going to wear some kind of message-y tee shirt today but the only one I could find that was totally relevant was Needs More Coffee. We haven’t completely finished the books for June, but NAWBO OC realized a slight profit of $3,000 in the 2017-18 term! This is big news. In addition to the decline in membership over the past several years, we also experienced a decline in support from Corporate Partners and funders. Again, this is the result of larger economic forces – and it’s challenged us to find new ways of engaging partners that are built on both friendship and ROI. 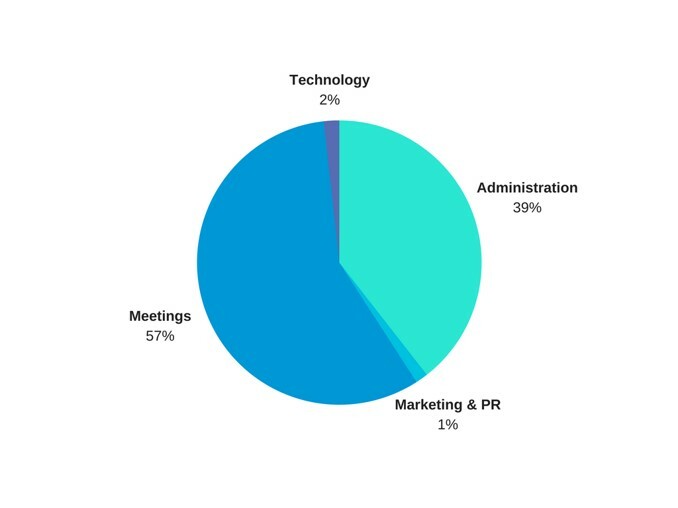 Here’s a visual breakdown of our revenue sources. And I’m showing you this because you are a shareholder and we are stretching ourselves to become ever more transparent. 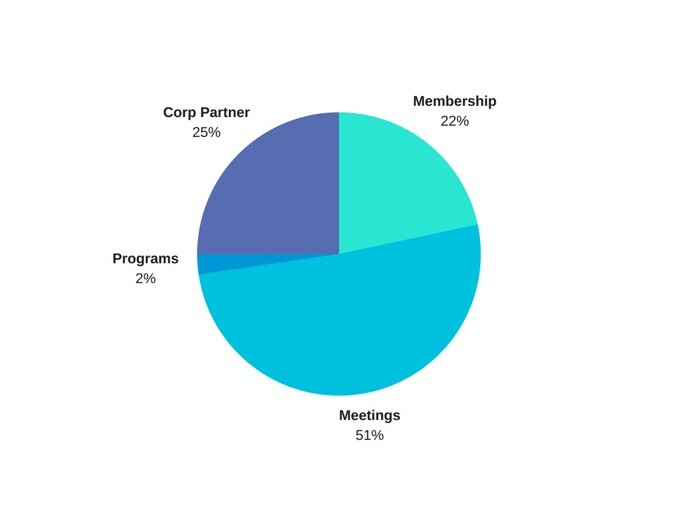 What you can learn from this diagram is that our dinner meetings are a large part of our revenue. Moving to the next slide, you can see that our dinner meetings are also a very large part of our expense. Now you might be tempted to look at this and say wow, administration is really high … shouldn’t that be going to programming? The answer is yes, because it is. There is very little in the Administration category that is not in direct support of programs or administering your membership. If I were to break down the actual time spent by our administrator on programs versus the time spent on things like maintaining our insurance, 98% of that administrative expense would go to executing programs, especially if we count updating programs on our website. Which brings me to our next point – our website! VOILA! www.nawbooc.biz. I worked on this thing for 9 months! It took so long because 1.) I didn’t know how to build websites when I started and 2.) I tried to be really thoughtful about how people would use it. It’s simple, you can find what you’re looking for, and personally, I think it’s also beautiful. We will be sending out a newsletter with all the features you may want to check out in the next couple of weeks. 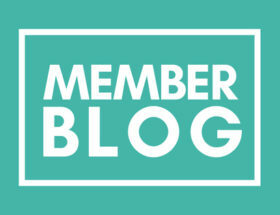 Redirecting our old website to this one, and moving over the Member Directory, will take a little time. In the meantime, happy exploring! The rebuilding of the website is the external product of our internal processes over the past couple of years. And I’m so happy that I get to be the President that unveils our new set of programs. And when I mean new, I mean old and new. The mission of the Orange County chapter of NAWBO OC is to position Orange County women business owners to build their power, passion, and profits for success. This was the mission of our founders, and this is our mission today. And our vision is to be the largest and most comprehensive community dedicated to the growth and empowerment of women entrepreneurs in Orange County. You’ve likely heard me talk about the changes to our programmatic roster. That too will come to you in a newsletter so that you can have the chance to sit with it. We won’t have all of our meetings on the first Tuesday anymore, so please do make a point to read the emails, check the website, and check-in on Facebook. Ya, obviously, you’re there, and you’re there, and I’m here. But what does that mean, really? Last October, I attended the national meeting of NAWBO in Minneapolis and I took home a copy of a new book, The Awakened Woman: Remembering and Reigniting our Sacred Dreams by Dr. Tererai Trent. The book is about dreams and the stories we tell ourselves, our communities, and the world. It’s a guide to reclaiming our stories, reexamining our ambitions, and uncovering the power in ourselves to re-create the world for the better. In the book, Dr. Trent explains that as women, we are often asked to set aside our wisdom and aspirations to take care of the personal and professional business of our lives. I have found that to be true in a million ways in my own life. I keep myself small. But just because I have a business that is categorically micro or small does not mean that our ideas or challenges are small. Micro and small businesses represent 99.9% of all U.S. firms – we’re not just an important part of the economy, we’re not just a driving force in the economy – we ARE the economy. -African proverb, as reimagined by Dr. Tererai Trent. This year is going to be full of conversation, unfolding and discovery. In our creed, it says “I will build a stronger world.” Fostering the success of women entrepreneurs will improve economic opportunity across Orange County, the nation, and, yes, the world. Regardless of your political or ideological position, we have the responsibility to ourselves and each other to bring our most genuine selves to the table in our quest to unleash new levels of women-led entrepreneurial growth in Orange County. We are bold, brave, and brilliant. And we are here.